Butterflyfish are very elegant in their appearance and graceful in their movements, much like the colorful winged insects from which they get their name. These fish are closely related to angelfish and they have a similar appearance with laterally-compressed bodies that enable them to slip between rocky outcroppings and crevices in the coral reefs in which they life. Butterflyfish also have an extended snout with a small mouth that allows them to reach into cracks and holes to find the small organisms on which they feed. 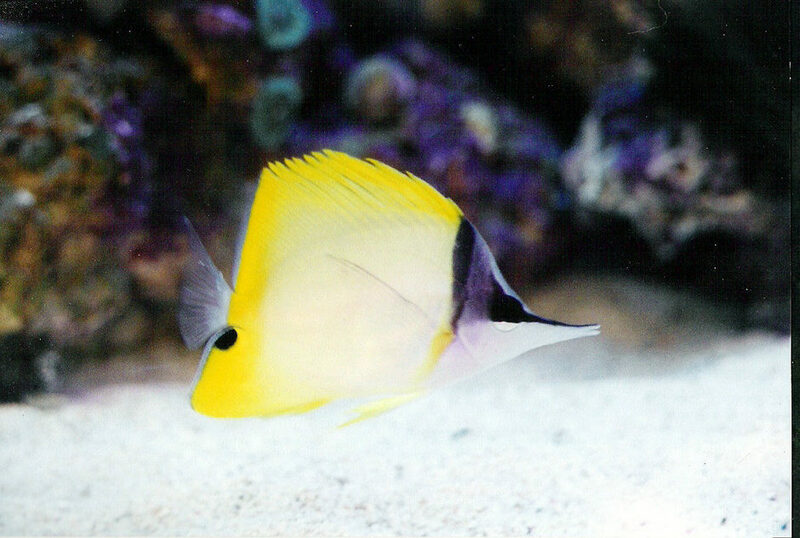 There are currently about 120 species of butterflyfish that have been described, but only a relatively small number of them are adaptable to the home aquarium. The main problem is that butterflyfish have a very specialized diet which, depending on the species, may include corals, anemones, and marine invertebrates. This if the primary reason why butterflyfish can be such a challenge to keep in a reef tank, though there are species that have been described as reef-safe. Spotted Butterflyfish (Chaetodon guttatissimus) – Recommended for both soft and stony corals, the spotted butterflyfish grows up to 5 inches long and it can be found throughout the Indian Ocean. This species is somewhat difficult to keep as it feeds on coral polyps and polychaetes and requires multiple feedings per day. It is also somewhat rare in the aquarium trade. Tahiti Butterflyfish (Chaetodon trichrous) – This species is somewhat easy to keep compared to other butterflyfish and it grows up to 5 inches long. The Tahiti butterflyfish comes from the eastern Pacific ocean, though its range is limited to the society islands, Tahiti, and Tuamoto. This species is recommended for beginners because it has been known to accept flake foods. These fish do best in trios until a breeding pair is established, then the third fish should be removed. Vagabond Butterflyfish (Chaetodon vagabundus) – An omnivorous species, the vagabond butterflyfish is easy to keep but it does get fairly large – up to 9 inches long. 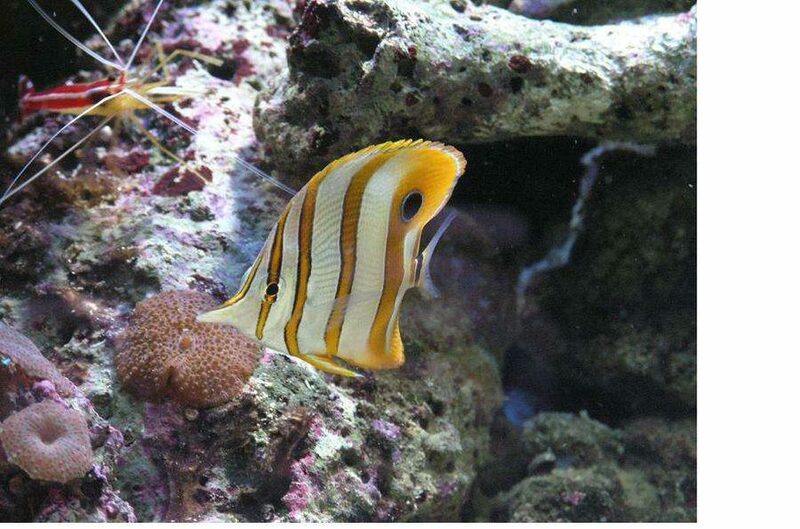 This butterflyfish is found in the Indo-Pacific and it feeds on algae and coral polyps as well as worms and crustaceans. These fish can be kept in pairs and they tend to acclimate well to captive conditions. Pennant Butterflyfish (Heniochus chrysostomus) – Another species found in the Indo-Pacific region, the pennant butterflyfish grows up to 7 inches long and is fairly easy to keep. These fish will accept a wide variety of foods, though they do require several feedings per day. If you keep them in pairs, be sure to introduce both at the same time to prevent territorial disputes. Atlantic Long Snout Butterflyfish (Prognathodes aculeatus) – As you can guess from the name, this species comes from the Atlantic Ocean – the western Atlantic, to be specific. The Atlantic long snout butterflyfish grows to only 4 inches long and it is moderately difficult to keep. These fish feed on small invertebrates and they tend to live alone rather than in pairs. Pearlscale Butterflyfish (Chaetodon xanthurus) – One of the most popular species, the pearlscale butterflyfish is native to the Western Pacific and grows up to 5.5 inches long. This fish will accept a wide variety of foods and can be kept in pairs, though you must introduce both at the same time. 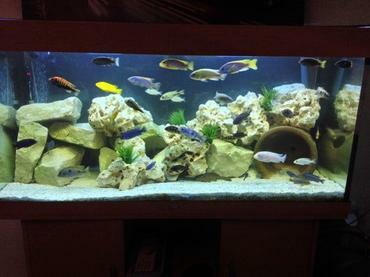 These fish are fairly easy to keep and are best kept with peaceful tankmates. If you’re thinking about adding butterflyfish to your reef tank, be sure to select a species from this list or do your own research to find species that are reef-safe. You’ll also need to make sure that the species you choose is compatible with the parameters of your tank. Corals can be very finicky, so you’ll want to cater the tank environment to meet their needs and then choose a species of butterflyfish to match. Because a reef tank is such a fragile environment, you need to start things off on the right foot with some extensive research. Not only do you need to learn everything you can about keeping a reef tank in general, but you need to put some careful thought into which corals and fish you are going to keep. There are many different corals to choose from but you must remember that they are similar to aquatic plants in that different species have different requirements for lighting and nutrients – you need to pick species that are compatible with each other and compatible with your tank. If you’ve done the research to choose the best inhabitants for your reef tank, you’ll be much better off in the long run. Once you have set up your tank, all you have to do is achieve the right balance in your water chemistry and tank parameters then maintain that balance through the use of high-quality equipment and routine maintenance. 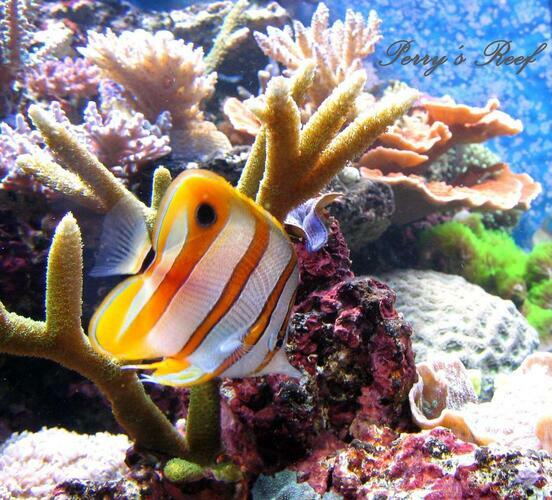 Filtration is of the utmost importance in a reef tank – perhaps even more so than in a fish-only tank. While some corals are able to move, they rely on the current to bring food and to carry away waste products. The filter you choose will largely be responsible for producing water movement, though you may need to add some extra power heads. In addition to choosing the right filter for your reef tank, you should also put careful thought into your lighting system. The lighting for a reef tank serves numerous purposes. In addition to illuminating your tank so it looks its best, light provides energy to support photosynthesis in your corals. Corals are typically divided into two groups by light requirements – low-light corals and high-light corals. Choose a lighting system that suits the needs of your corals but that won’t overheat the tank. You may need to install an aquarium chiller or auxiliary fan, depending what kind of lighting system you go with. There is a great deal more to be said about setting up and maintaining a reef tank. For now, however, remember the importance of doing your research to choose reef-safe species of fish an make sure you stay on top of your routine maintenance tasks to keep the water quality in your tank high.